In eight seconds Dalton Merrill's professional bull riding days—and the fame he enjoyed—ended. When the adrenaline-junkie returns to Lone Creek Ranch to heal, he discovers a single reckless romp with sweet Emilee Walker has left her with more than a little heartbreak. She’s carrying his child. The last thing he wants is to be tied down with a wife and a son. Emilee Walker trusted Dalton with her heart, and he left her for the rodeo. She wanted Dalton to return home, but not like this. 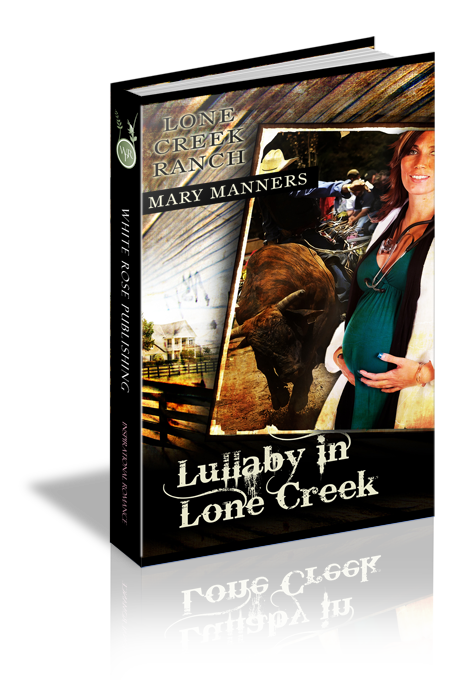 Now she wonders if it's responsibility or love that holds him on Lone Creek. This time she vows to show him what family ties and faith in God really means. Contest wins: Finalist, Inspirational Reader's Choice Awards (Tender Mercies). Dalton swiped a hand across his clammy forehead as the rolling, sage-green pastures of Lone Creek Ranch came into view beneath a veil of late afternoon sky. Dust curled around the tailgate of his pickup as it rumbled over the packed-dirt road, and the thump of a heavy bass blasting from the CD player drowned out all sound except the nagging voice inside Dalton’s head. Washed up at twenty-seven. Call it a day, Dalton. His head pounded in time to the music, and his stomach roiled at the realization that his bull-riding days were over—for good. A tumble from Rough Ride, the prize-winning bull he’d drawn in the final round of the World Championships, had all but severed his middle finger and dislocated two others from Dalton’s right hand, requiring thirty-two neat stitches to put his hand back together. The fingers would never grasp another rope, at least not in a World Championship—or anywhere else on the circuit, for that matter. The doctor had made that perfectly clear. Now, nearly three weeks after that fateful day, Dalton tried not to glance at his bandaged hand as it lay throbbing across the steering wheel—the pain he could take, no problem. It was the mangled fingers and the fact that his hand would most likely never be fully functional again that made him sick to his stomach. The taunting voice clicked on again. If you can’t ride bulls, what’s the point in living? Dalton reached for the radio dial and cranked Garth Brooks to full-blast as the oversized wrought-iron entrance gates to Lone Creek rose on the distant horizon like a majestic sentinel. He didn’t know why his parents had insisted on installing the gates so many years ago. They remained open at all times…anyone was welcome. And when his dad died, his mom carried on the tradition for over a decade. With her passing the year before, Dalton’s older brother, Carson, stepped up to the plate. Dalton had always been drawn to the lush pastures framed by rugged Smoky Mountains. They seemed to change with his mood, and the distinctive sweet scent of hay that mingled with musky earth, sweat and dust, felt like home. As a child every nook and cranny of the stable, coupled with the mystery of rippling creek water and valleys explored on horseback, had held endless adventure. But that adventure lost its thrill over time and Dalton longed for more—speed, the feel of a bull beneath him as the crowd roared, adrenaline pumping through his veins like fire. Dalton’s gaze swept the dusty road ahead as he sighed. So much for adventure. He was back at the homestead again, like it or not, and he’d make the most of it if it killed him. He squinted into sunlight as the whitewashed paddock fence laced around a bend in the road. He suddenly felt like one of the horses that grazed along the sunlit pasture—confined to a cross-posted barricade with no means of escape. Sweat dampened the small of Dalton’s back and he lowered the driver’s window to let a cool breeze rush across his face and through his hair as he sucked down a breath. Manure burned his nostrils and dust motes danced beneath a halo of sunlight…yeah, he was home again. As he closed the distance between the pickup and the ornate arch spanning the wrought-iron gates, which proudly displayed the Lone Creek Ranch emblem, Dalton found the road at the entrance to the ranch was no longer a series of gravel-laced divots, but neatly black-topped. His older brother, Carson, had mentioned he’d done a bit of work on the road, and had some construction going on at the property, too. But this, well, it was more than Dalton expected. Along the far side of the valley, back-dropped by haze-covered Smoky Mountains that were just coming into peak color, he saw a semi-circle of small log cabins nestled along the creek. Dalton stopped short, his jaw dropping. Black-topped drive, cabins, a new wrought-iron entrance gate…what was up with that? Had he really been gone that long? The heavy thump of music startled Emilee and she felt the ground vibrate as she worked in the first stall of the stable with a mare named Lucky Girl. She turned and glanced through the open stable doors to see a mud-splattered truck racing up the drive. The truck might have been black at one time…or possibly midnight blue? She couldn’t tell for all the dirt caked from hood to wheel wells. But whoever was behind the wheel was driving way too fast. Gravel spit from the rear tires in an angry rooster tail, leaving a dark trail of dust that clung to the air long after the truck hit the black-topped entrance. “Who on earth…” Emilee’s voice faded as she turned her attention from Lucky Girl and left the stable to stride across the paddock, toward the road. Someone was about to get a piece of her mind—and how. No one drove around Lone Creek like his hair was on fire. It was dangerous—for the animals, the workers, and the guests—and just plain stupid, too. Now that Lone Creek was officially open for business, its camps up and running, the last thing they needed was the bad publicity of crazed drivers racing along the property. The truck skidded to a halt inches from the stable, and Emilee rushed toward it, holding her belly as she picked up the pace. Her blood boiled, and a flush of heat washed over her cheeks as the music died and the driver’s door swung open. “Hey, you!” She jabbed a finger toward the truck as one soiled cowboy boot eased over the door jamb and settled on the blacktop, along with a battered duffel bag that was tossed from the seat. “What do you think—” Emilee’s voice froze in her throat as the second boot dropped, and the driver unfolded himself before turning to look at her. He reached for a battered cowboy hat from the passenger seat and slipped it on his head, positioning the brim low across his cobalt-blue eyes. “I…yes.” His words were clipped. How dare he be angry at her? He massaged his damaged hand through thick, gauze bandages, and Emilee fought the urge to feel even a smidgen of sympathy. She’d heard about the accident from Dalton’s brother—what he’d been through the first weeks of recovery—she just hadn’t been ready to see the destruction first hand. “Emilee, wait! I’m just shocked that’s all.” She could hear his footsteps behind her. At the stable door, she grabbed an empty feed bucket and turned to lob it at him, missing his head by mere inches. “You want to…talk?” She turned her back to him again and rounded the stable, double-timing it to the small, whitewashed clapboard cottage beside the main house. Once inside, she gave the door a stiff slam and rested her back against the wood, her arms crossed over her belly. Scalding tears flowed in torrents as the echo of Dalton’s heartless words shattered what was left of her broken heart. Q1 Lullaby in Lone Creek is based on II Corinthians 5:17, a verse that addresses becoming new. How do you think this verse applies to Dalton and Emilee, and their lives? Q2 What is Dalton most afraid of? What is Emilee most afraid of? How can our fears keep us from enjoying the full fruits God provides? Q3 Emilee experiences much guilt over the fact that she broke a covenant with God. Have you ever experienced guilt as a result of your actions? What did you do? Q4 What kind of influence do Carson and Jessica have on Dalton and Emilee? Is it important for elder siblings and best friends to counsel and guide? Why or why not?? Q5 What do you think might have happened between Dalton and Emilee if Dalton had not injured his hand? What effect might this have had on Colt? Explore a different ending to Lullaby in Lone Creek. Q6 How can free will affect a person's life? What does the Bible say about free will?